Water Sprite (Ceratopteris thalictroides) is an aquatic fern with a wide geographical distribution, usually originating in pan-tropical climates and found rooted in muddy areas on the floor of lakes and ponds. 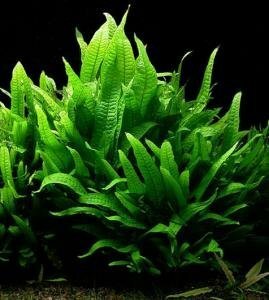 It is a soft leaved green plant with numerous fronds, which make for perfect cover for smaller goldfish and newly hatched fry. While Water Sprite is usually planted into the substrate of the tank, it can also be used as a floating plant. Water Sprite has a fine and delicate root structure, meaning that it gains the nutrients it needs from the water rather than its substrate. It generally grows to around a foot tall. Water Sprite is an easy-care plant that is among the fastest growing goldfish tank favourites, requiring just moderate lighting levels and a pH of around 6.5-7. 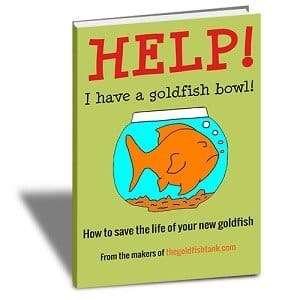 It is a good choice for the novice goldfish keeper, and is great at removing excess nutrients from the water. It does not have any special nutritional requirements, but adding a good quality general purpose fertilizer with Co2 to the water will encourage growth and really make your plants thrive. Water Sprite reproduces quickly, so one specimen can remain viable in the tank by means of propagation for many years. 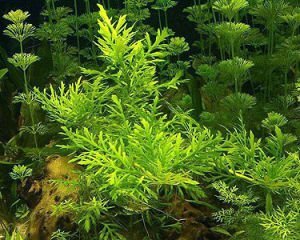 The soft, highly palatable leaves of Water Sprite are incredibly appealing to the hungry goldfish, something that would be a problem for many other aquarium plants. However, as the Water Sprite grows and reproduces at an impressive rate, the plant is more than capable of keeping up with demand, unless you have planted only one small lone specimen and have a lot of hungry fish! Water Sprite is one of the easiest goldfish tank plants to find offered for sale, and can be found in pet shops, specialist aquarium retailers, and water garden centers. You can also order online for delivery to your door . 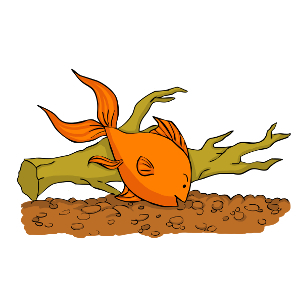 Try to select a medium sized plant rather than a small one for a lone purchase, or consider buying three or four of the plants to get you started and give them a chance to grow and reproduce before your goldfish eat them all!